A couple of major trends in software development — in particular, open source collaboration and the design of social network/user-generated content platforms — may provide useful insight for the future of marketing management. After all, the increasing number of marketing channels and the increasing granularity of initiatives in them combine to form ultra-large-scale marketing environments that share similar properties to ultra-large-scale (ULS) software systems. It’s not coincidental that many of the leading web sites whose value is derived from crowdsourcing and peer production — MySpace, Facebook, YouTube, Wikipedia, Twitter — are also at the heart of the digital marketing maelstrom. The underlying forces are the same, and they feed each other. Where would Twitter be without the championship of so-called social media marketers? Where would social media marketers be without the latest infusion of attention to their mission that Twitter has brought? At a certain scale, the closed-loop, top-down structures of old-school software — and old-school marketing for that matter — simply don’t cut it. Instead, one has to design mechanisms for enabling broad participation and co-creation, yet do so without losing the core integrity of the system as a whole, its gravitational center. In reading Kazman’s work, I followed a trail back to a 2006 report by Kazman and numerous collaborators on Ultra-Large-Scale Systems: The Software Challenge of the Future. Written for the U.S. Department of Defense (DoD), advising them on their goal of “information dominance”, it has a funky yet fascinating twist if you substitute “systems” and “software” with “marketing” and swap “DoD” with “your company”. 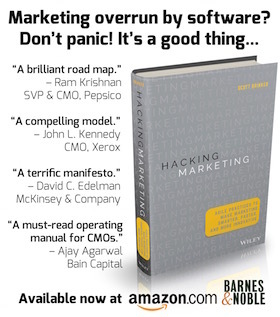 Have computer science and marketing already converged, but they just don’t realize it yet? What role does large data in these large scale models, particularly as they apply to marketing systems? 1. The deluge of data seems to now be one of the drivers behind making semantic web efforts real. Data is a silo is nowhere near as valuable as data that can be linked into the rest of the universe. And the ability to link data with casual associations (i.e. RDF) rather than strict schema coordination makes linked data a whole lot more feasible. But it is a big paradigm shift from the way most people think of data management. 2. The rise of “alternative” database architectures for large-scale systems, such as Amazon S3 and Google BigTable, are enabling much bigger data sets to be efficiently harnessed — and are also helping to change the way we think about data in the context of these large-scale applications. And most of these initiatives are still very early in their evolution. I’m looking forward to seeing how they advance over the years ahead.